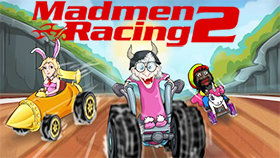 Madmen Racing is an incredibly fun and unique racing game with cute and colorful visuals perfect for kids and families developed by Dmytro Borozenets. There are a total of 15 characters in this game, each controlling a different vehicle ranging from a hamburger car and a Trojan horse car to a flying carpet and even a spaceship... 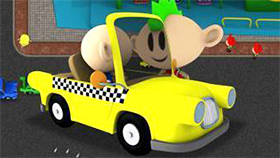 However, when you start out the game, you are only given one character along with a simple car. To be able to unlock the other characters, you’re going to have buy them using money. The game has a total 18 stages, each stage rewarding you with more money the better your achievements are. 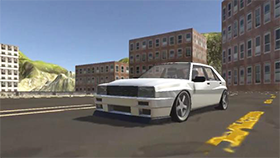 The interesting thing about this game is that your vehicle has a Nitro feature. When using Nitro, your vehicle will accelerate, however the Nitro can only be used for a short period of time, and after it’s used up, you’ll have to wait for it to regenerate on its own before you can use it again. You’ll need to pay attention to the vehicles’ stats. Each vehicle has 6 different stats and you can use the money you’ve earned to upgrade these stats and make your vehicles better. Hitting the snowmen will slow you down. After successfully performing a flip, your Nitro gauge will increase faster.